This walk is one of the most spectacular and demanding on the coast path, but the effort is worth it for the fantastic scenery. 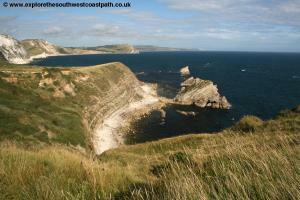 The path begins at beautiful Lulworth Cove and after rounding the cove enters the Lulworth Ranges, a military firing range. 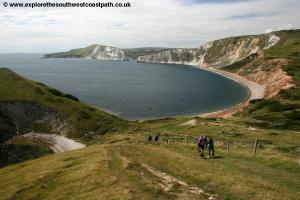 The coast through the range is some of the most spectacular and unspoilt on the path, although there are some steep climbs, especially around Worbarrow Bay. The village of Tyneham is a short but worthwhile diversion inland. 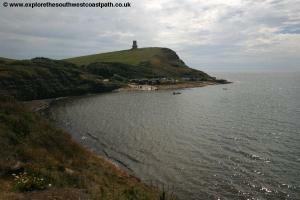 Once through the range you come into the village of Kimmeridge, then pass Clavell Tower. 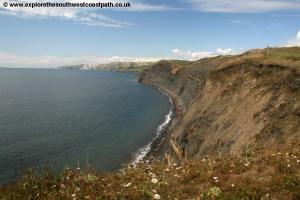 There is a steep climb up Houns-tout Cliff but you're rewarded with spectacular views of St Aldhelm's Head and Chapman's Pool. 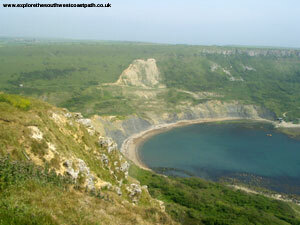 Lulworth Cove can be reached from the B3071, which joins the A352 near Wool. There is plenty of car parking at Lulworth, though it can be expensive. Accommodation in Lulworth is limited. 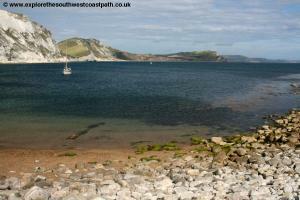 There are two Hotels that I know of, The Lulworth Cove Inn and The Cromwell House Hotel. 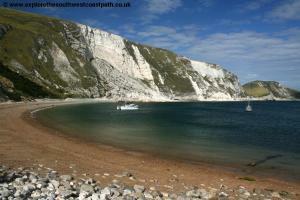 If you prefer Self Catering accommodation, there is the Durdle Door Holiday Park. There is no accommodation at Chapman's Pool. 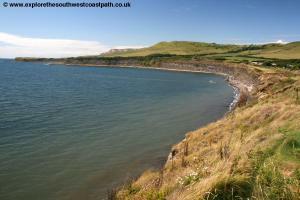 There is one place (Kimmeridge Farmhouse) that I can find in Kimmeridge. If you can't find any accommodation at Lulworth or Kimmeridge, you might need to stay in some of the larger towns nearby, such as Wareham, Dorchester, Weymouth or Swanage. 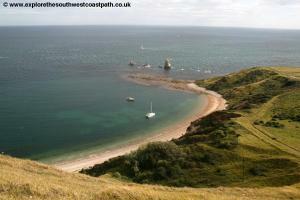 This walk starts in the beautiful village of Lulworth Cove and passes through the Lulworth Ranges. 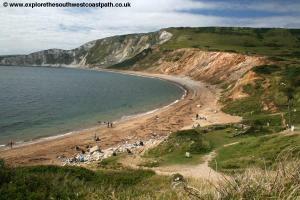 The Lulworth Ranges are generally open all weekends, except for six weekends a year, and through school summer holidays. For details of other openings, and the weekends when the path is closed, you should call 01929 462721 and ask for information about the Lulworth Ranges. 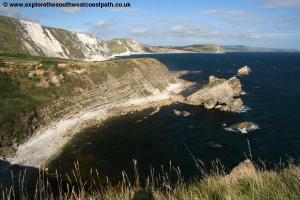 There are also details on the South West Coast Path Association website. The opening of the range walks is well publicised on the road into Lulworth and there is also a display board on the visitors centre in Lulworth Cove. I am not sure when the telephone line is open, but I called late on a weekday evening and it was answered, so they seem to be open fairly long hours. Lulworth is a pretty village, but there are no other amenities on the path until Kimmeridge (which has basic facilities), so make sure you have everything you need before leaving Lulworth. It's worth taking some time to look round the excellent visitor centre at Lulworth Cove. The coast path begins on the beach at the bottom of the road down to the beach, but it's worth heading up the small hill to the right where there is the impressive Stair Hole. Once down on the beach (where there is an excellent cafe), you have a choice to get round the bay. 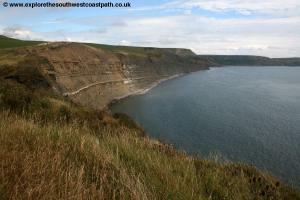 The official coast path goes over the top of the cliffs, but you may choose to walk along the beach instead, which should be possible except when the tide is very high. Although easier, it's still quite heavy going as the beach is a mixture of sand, shingle and pebbles. The best part of the beach actually seems to be at the east side of the bay, where there is more sand and far fewer people. However you get round the bay, you will arrive at Pepler Point. There are excellent views round the cove from here and you can also see the well worn coast path up to Durdle Door in the distance. 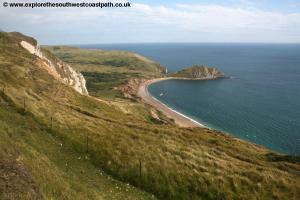 As you round Pepler Point you come to the fence that marks the start of the Lulworth Ranges. On the walk through the ranges you must stick to the path marked between the Yellow Markers, as only this area has been cleared of ammunition. Once through the fence into the range there is the fascinating fossil forest, an area of rocks where the fossilised remains of trees can easily be seen. There are steps down to this area if you want to take a closer look, but no steps back up at the other end. Once past the fossil forest is fairly level to Smugglers Cove and Mupe Rocks. 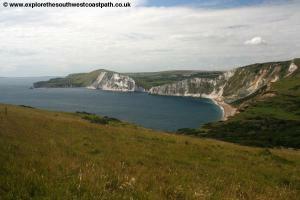 The view from the headland here is fabulous, with the crumbling white chalk cliffs of Worbarrow bay ahead. The path rounds the small headland to Mupe Rocks, with a field on the left where there were several horses and ponies grazing when I did the walk. As you round the corner, there is Mupe Bay below. This beach is open to the public and, being east facing, is quite a sheltered and beautiful shingle beach. The east end of the beach is closed though, due to the large cliff fall, which was probably partly the result of firing. 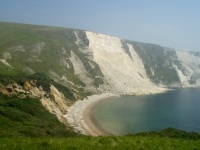 Once past Mupe Bay, there is a very steep climb up Bindon Hill, although the climb is worth it for the views from the top. 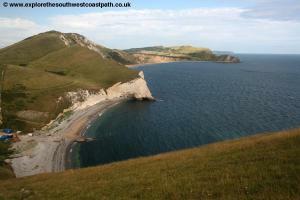 Not only are there superb views of Mupe Rocks and Mupe Bay behind you, but also Worbarrow Bay and Worbarrow Tout ahead of you and the ranges (where there were many rusting tanks when I walked this part of the path) and Lulworth Castle inland. 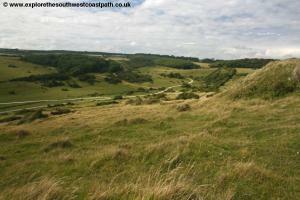 The path descends Bindon Hill as steeply down the other side, where you come to the pretty Arish Mell. Unfortunately, this beach is not open to the public. The beach seems to be used by the military, as there is a road going across the beach and right into the sea, blocked by a large fence and gate. Once round the beach, the path again climbs up the huge cliff. When I walked this part of the coast path, a sea mist blew in, but this cliff was so high I could get above the mist, making for an interesting view. 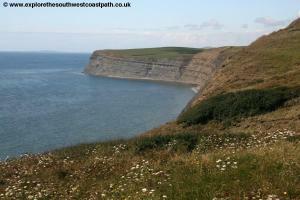 There is a welcome picnic area at the top of the cliff, where you can stop an admire the fantastic views. 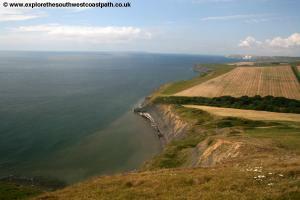 The coast path stays at the top of the cliffs round much of the bay, but then descends very steeply down the other side of the cliff - it is almost a 45 degree slope in places. 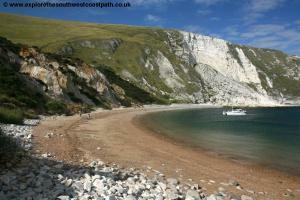 At the bottom of the cliff, around Worbarrow Tout and Worbarrow Bay there are a couple of beaches. Unfortunately the poor access means these beaches don't appear to get cleaned - they were filthy with rubbish, driftwood, plastic and fishing equipment when I walked this section of the path, although were still proving surprisingly popular. 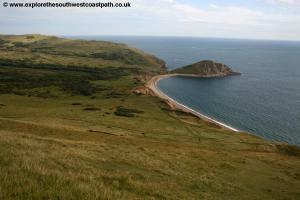 The coast path does not go up Worbarrow Tout, although there is a path up there if you want to go up. 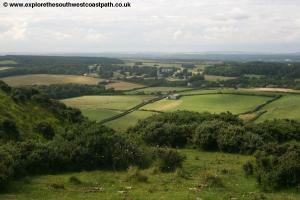 There is also a path inland here to the village of Tyneham, where there is also a car park. If you can spare the time and energy, Tyneham is well worth visiting. The village was taken over by the military during the Second World War and the residents forced to move out. Despite the promises of the military they were never allowed back and most of the houses are now derelict and have many bullet holes in them. The school house and church have been restored however and are open to the public, with some interesting displays and history of the village. Personally, I found the village fascinating, but it is very sad that the people who lived here were so betrayed by the military. However the military presence does have it's advantages, without it, the area would almost certainly be far more developed and accessible, probably making it a tourist magnet. 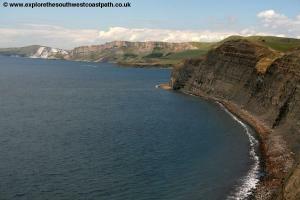 As it is currently, this beautiful part of the coast path is virtually deserted. 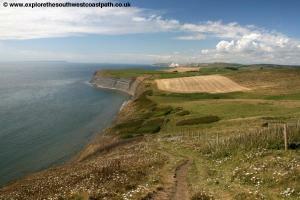 Back onto the coast path and the path then begins the climb up Tyneham Cap. 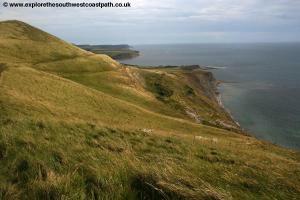 This climb is more gentle than the previous on the path and you get views of Kimmeridge Bay and Brandy Bay below. 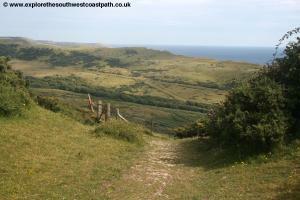 A little under a mile and there is another path to Tyneham, making an alternative inland route. As the path descends Tyneham cap be sure to take the path to the right, as there is another inland path here. The path does zig zag about a little at the top, so stick between the yellow markers. 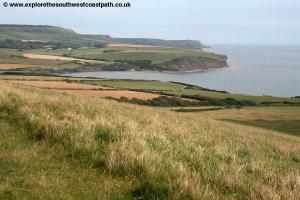 Once down Tyneham cap the coast path remains fairly flat. Around this part of the coast, there are flat rocks just below (and sometimes just above) the surface, with Long Ebb sticking out quite a distance into the sea. 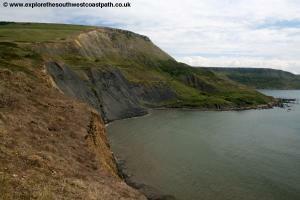 As you round the headland there is a large ledge just under the cliffs, which goes round into Kimmeridge Bay. It seems a popular spot with fisherman, but does seem to smell a bit of rotting seaweed. 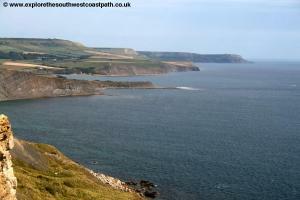 There are good views round Kimmeridge Bay to Clavell Tower on the headland at the other side of the bay. 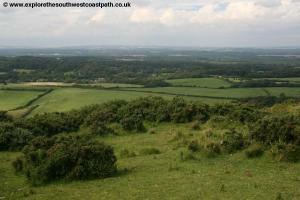 As you leave the Lulworth Ranges there is a an oil well on the left, although it is virtually silent. Just after the oil well, there is a pretty row of cottages on the cliff top. 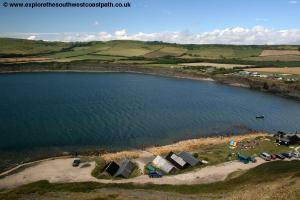 There is a car park and toilets at Kimmeridge Bay but not a lot else. There is sometimes a snack van in the car park though. 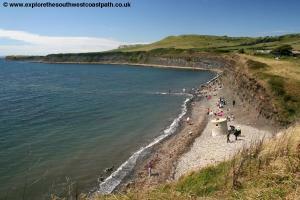 The village of Kimmeridge is a little under a mile inland. 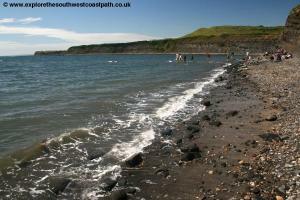 Kimmeridge Bay is an interesting beach and there are many fossils to be found in the crumbling rocks at the back of the beach (and on the beach), although notices warn against collecting any fossils. The beach itself is a mixture of gray rock, slate and shingle with a small amount of sand (and some clay in places too), so it's not the best of beaches. 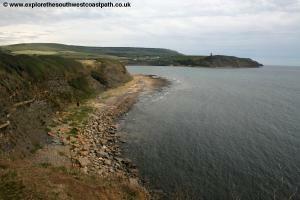 The path out of Kimmeridge Bay climbs fairly steeply to Clavell Tower. 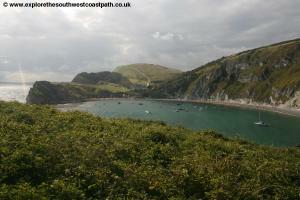 Once at the top there are good views of the bay and back all the way round towards Lulworth. 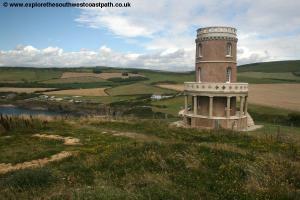 Clavell Tower was built in 1830 and is famous as it was used by Thomas Hardy. The eroding cliffs mean that the tower is in danger of falling over the cliffs, and the Landmark Trust is raising money to move the tower back from the cliff edge. Looking at the condition of it though, it looks as if a strong wind would be enough to make it collapse! The tower is now marked Danger and fenced off, so it must now be in a dangerous state. The headland around the tower was very pretty when I did the walk as it was covered with yellow flowers, as was much of the path towards Chapman's Pool. 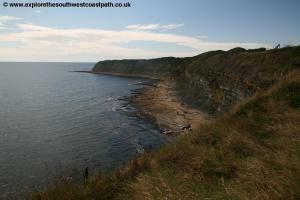 The part of the path between Kimmeridge Bay and Chapman's Pool suffers from a lot of erosion, and doesn't seem to be used much, as it was quite overgrown in places when I walked this part of the path. All along this section of the path there is rock just below or just above the water, and one part juts out quite a long way out to sea under the cliffs by Clavell Tower. It is mostly covered by seaweed though and on a warm day makes quite a smell. Compared with the steep cliffs earlier in the walk, this part of the path is quite gentle for most of the way, and there are views of several small bays as well as pleasant fields inland. The geology of the cliffs is also interesting here, as there are some parts of the cliffs that are obviously harder, as they have eroded less and slope down towards the sea as you look East. There are views towards Houns Tout Cliff and St Aldhelm's Head, where you can see the pretty row of cottages. As you approach Egmont Point, there is a pretty waterfall over the edge of the cliff. The climb up Houns Tout Cliff is very steep, but worth it for the rewarding views of Egmont Bight and Chapman's Pool on the other side of the cliff. Chapman's Pool is beautiful, with the sea a lovely blue shade in the shallow waters of the cove and there are often some boats moored in the bay. The descent down the other side of the cliff is steep and takes you a little inland. If you want to go down to the beach at Chapman's Pool, there is a small path (it is well signed) and it's around a 1/4 of a mile walk. The beach is a mixture of sand and shingle and (probably due to the poor access) does not appear to be well used. There is no parking at Chapman's Pool, as there isn't a road and there is only a small road (with no parking) to the little row of cottages at Hill Bottom. 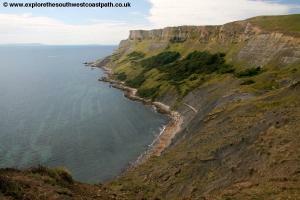 To get back from Chapman's Pool you will need to head in-land to one of the nearby villages. There are several paths inland to Kingston, one from the top of the cliff, one from the bottom of the cliff and one that starts from the end of the row of cottages at Hill Bottom. Kingston is a very small village, although very pretty and there is a church and a pub. 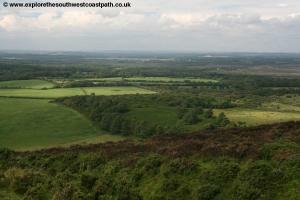 From Kingston there are buses to Swanage, Corfe Castle, Wareham and Poole. 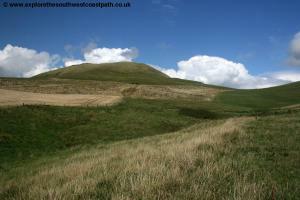 Alternatively there is a path from Hill Bottom into Worth Matravers, which is a slightly larger village than Kingston. Worth Matravers also has a pub, as well as a car park and toilet and there is also parking nearer the coast path, by Renscombe Farm. 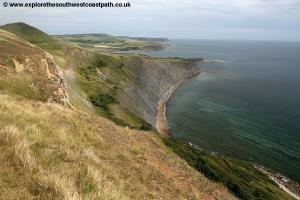 From Worth Matravers there are occasional buses into Swanage, Corfe Castle, Wareham and Poole. As mentioned above, there is only a tiny road down to Hill Bottom, and there are no bus services from here. The alternative is to head East into Worth Matravers or North into Kingston. There are only a few buses a day to Worth Matravers (generally only in the morning) though. Kingston has generally an hourly service (with a few gaps) into Swanage or into Corfe Castle, Wareham and Poole in the other direction. The buses depart from the main road near the Scott Arms. 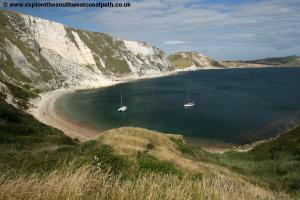 To get back to Lulworth by public transport is time consuming. First you will need to get the bus from either Kingston or Worth Matravers to Wareham station. From Wareham Station there are hourly trains to Wool station, one stop west down the line. From Wool Station there is a bus every two hours into Lulworth, although the last bus is fairly early. The only alternative is a taxi, either from Worth Matravers or Kingston or perhaps from Wareham if you get the bus to there. The pubs in Worth Matravers and Kingston are likely to have the number of a local taxi company. Another possibility would be to park at Wool station, where there is a small free car park. From there you can get the bus into Lulworth to the start of the walk, then get the bus from Kingston or Worth Matravers back to Wareham station for the train back to Wool (one stop west of Wareham). For more details of the bus and rail services, see the links below. Ordnance Survey Landranger maps 194 and 195 cover this area of the coast path and they are available from most book shops nationwide. They are also stocked at the Swanage Tourist Information Centre and the Lulworth Visitors Centre. 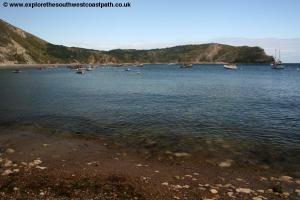 The following links show the ordnance survey maps of the coast path between Champman's Pool and Lulworth Cove.